The widow of murdered soldier Lee Rigby has said "justice has been done" after seeing the High Court firmly reject appeals by his killers. 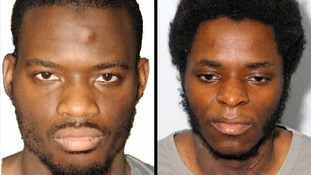 A panel of three judges threw out the conviction and sentence challenges by Islamic fanatics Michael Adebolajo and sentence reduction challenge by Michael Adebowale. Rebecca Rigby, who was estranged from the soldier at the time of his death, joined her late husband's family in court and later choked back tears as she read a prepared statement outside. I would like to thank everyone who made today's verdict possible. We are relieved that this is over and justice has been done. I would like to thank everyone for their continued support over the last 18 months and hope I can now build a future for my son Jack and ensure that (Lee's) memory lives on. The Court of Appeal has thrown out an appeal by Michael Adebowale to have his minimum 45 year sentence reduced. It comes after judges rejected an appeal by his co-defendant Michael Adebolajo against his conviction. 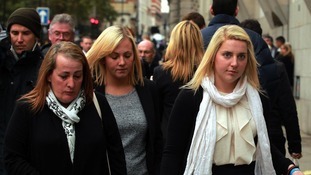 Lee Rigby's wife sobbed with relief in court as the decision was announced. The widow of murdered soldier Lee Rigby has attended the Royal Courts of Justice to hear the appeals of his killers. Michael Adebolajo this morning lost his bid to challenge both his conviction and a whole-life sentence which condemns him to die behind bars. The panel of three judges sitting at the High Court took just a few minutes to dismiss the argument that he had not broken the Queen's Peace, ITV News Correspondent Juliet Bremner has reported. Lawyers for his co-accused Michael Adebowale, who was jailed for life with a minimum term of 45 years, are separately arguing for a reduction in his sentence. Michael Adebolajo, one of the two Islamic fanatics found guilty of the murder of soldier Lee Rigby, has lost a Court of Appeal challenge against his conviction. The case was heard by Lord Chief Justice Lord Thomas, sitting at the Court of Appeal in London with Lady Justice Hallett and Mr Justice Openshaw. The extent of the security and intelligence agencies' prior knowledge of soldier Lee Rigby's murderers will be revealed this week as a long-awaited report from a parliamentary watchdog is finally published. 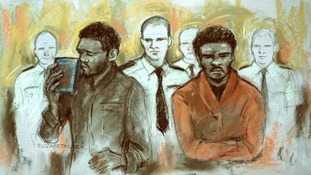 Michael Adebolajo and his younger accomplice Michael Adebowale slaughtered Fusilier Rigby in broad daylight in May last year. It quickly emerged in the wake of the killing that secret services were aware of both Adebolajo, then 29, and Adebowale, then 22, but questions remain over whether they could have been more closely monitored. An investigation by the Intelligence and Security Committee (ISC), which has been subject to much debate over its bite, has now concluded and a report, described by Whitehall officials as "very substantial", will be released on Tuesday.